Many scholars have responded to James Tabor’s report (and new book) on the so-called “Patio Tomb” at Talpiot, which he and Simcha Jacobovici claim to be the grave of early (as in first-century) Christian disciples, complete with a “sign of Jonah” (which looks like a poorly-cut nefesh to me, especially since it was vertically oriented; Eric Meyers, Jodi Magness, and a host of others have thrown their weight behind the nefesh interpretation as well) and a six-line inscription testifying to belief in the resurrection (even though the inscription can’t say that). The breadth and swiftness of the response has been impressive, as a host of good critical scholars have patiently pointed to numerous flaws in the interpretation of the data, showing why this find isn’t what Tabor/Jacobovici claim it to be. 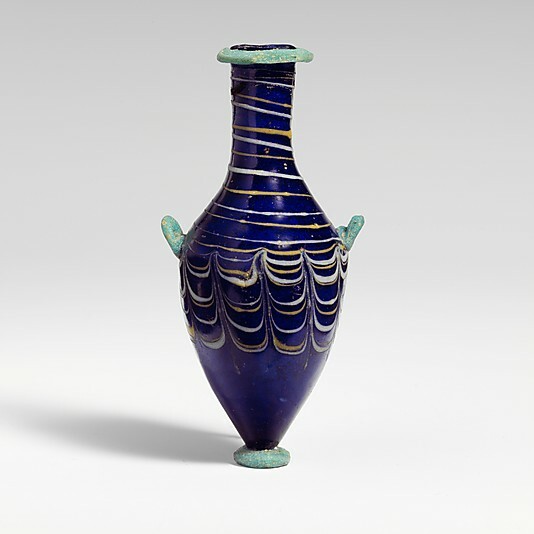 EDIT: After seeing the picture to the right, I am now persuaded that this was not a nefesh after all; of all the suggestions I’ve seen, it most resembles a type of perfume-bottle (unguentarium). At any rate, it still doesn’t look like a fish. And the ossuary itself seems to be decorated as a miniature house, complete with a front door and side window. But one thing I haven’t yet seen anyone point out is the fundamental contradiction between Tabor’s and Jacobovici’s interpretation of the Patio Tomb and their interpretation of the so-called “Jesus Tomb.” On the one hand, they claim to have found the tomb of Jesus and his family, where Jesus’ body was moved from its temporary grave after the crucifixion. But on the other hand, they claim the Patio Tomb, all of 45m away (in a tomb they speculate may have been on the property of Joseph of Arimathea), “represent[s] archeological evidence related to faith in Jesus’ resurrection from the dead—presumably by his contemporary 1st century followers.” So let me get this straight: Jesus’ contemporary 1st century followers who were buried next to Jesus’ dead body believed in the resurrection of Jesus? How exactly does that work? If nothing else shows just how far Tabor and Jacobovici’s publicity-baiting will go, this outright contradiction makes it very clear: apparently they want us to believe the earliest Christian disciples believed that the Jesus whose body was decaying in a well-marked tomb a stone’s throw away had been raised from the dead. It would take more faith to buy that story than to believe Jesus was resurrected in the first place. P.S. We missed you in Virginia Beach. I was looking forward to hearing your paper. Thanks, John. I would have loved to make it to Virginia Beach, but I got double-booked for the day I was to give the paper up there, so I was obliged to honor my first commitment. Hi Jason, thanks for your comment. You surely raise a more than obvious point and one I have thought deeply about over the past five years. I have covered my own take on this in the book. Essentially it is an argument based on Paul, not the gospels, who provides us with our earliest take on the nature of resurrection–or as I would prefer–heavenly exaltation faith, i.e., Phil 2 hymn, etc. 2 Cor 5 is probably the clearest. Paul sees the old body as shuffled off like old clothes, the “self” is then naked, but not as with Plato, where the naked state is desired, the “self” is then “reclothed” with the new spiritual body. 1 Cor 15 elaborates further–the image of the man of dust is mortal, dust to dust, but the image of the man of heaven is “spiritual,” you know this well I am sure, the two kinds of “bodies” that he mentions. Other N.T. texts mention the “sea” giving up the dead “in it,” surely not implying those perished bodies must be somehow regathered. As you know the nature of the new body is something discussed extensively in 2nd Temple Judaism…Jesus is asked by the Pharisees and he says clearly that in the “age to come” there are not physical/sexually differentiated bodies. Herod thought John was “raised from the dead,” but no indication he thought the tomb of John was empty, etc. Too much to cover here but maybe you get the general idea. I also cover the various gospel account, esp. Luke and John, who have the “touch me” texts, with Jesus eating, which I consider very late and apologetic, cf. Celsus kind of objections…BTW, loved your JBL article as I think I wrote you. Thanks for the reply, James, and thanks again for the kind words about my JBL article. I had figured you might take the “spiritual resurrection” or “glorification” angle, but I don’t think it works in the least. Put it this way: if the earliest Christians believed Jesus had been spiritually “resurrected” while his body continued to lay there decaying, what exactly would have separated Jesus from everyone else again? As far as we can tell from the earliest sources we have (Paul’s letters and the speeches in Acts), the earliest Christian arguments rested on the resurrection of Jesus’ body as proof of his status as the “righteous one.” But if his body decayed just like everyone else’s, what exactly separated him from anyone else again? The idea of a man being spiritually glorified after his death was a pretty common motif (the Caesars being the most obvious example), but it’s pretty clear that the earliest Christians were claiming something else about Jesus, that his case was especially unique. That doesn’t seem to correspond with knowing that his body was actually going through the usual process of decay in a tomb just up the road. Paul does differentiate between “spiritual” body and “fleshly” body in 1 Cor, but nowhere does he suggest that Jesus’ resurrection left his “fleshly” body decaying in the tomb. Rather, he suggests that in the resurrection, the fleshly body is “changed,” transformed, “swallowed up” by the process of glorification. There’s no doubt that the earliest Christians claimed a distinction between Jesus’ post-resurrection body and that before the resurrection, but we don’t have evidence to suggest that they thought his fleshly body was still decaying somewhere, that his rotting fleshly corpse was somehow a topic of indifference. Even if the tomb claims aren’t genuine, I think Dr. Tabor makes a good point. There’s no really compelling reason, other than orthodox church doctrine, to think that the earliest Christians believed in a physical resurrection. The breadth and swiftness of the reaction against this book isn’t impressive, it actually is disgraceful how so-called scholars attack this before they have even had a chance to look at the evidence. Not to mention the unscholarly personal attacks that you perpetrate here via your insinuaton of “publicity-baiting,” which is a nonsensical phrase, BTW. My question is what do these people have at stake? Whose turf are they protecting? I understand Christian scholars have a stake in protecting the status quo regarding Jesus, but many of the attacks come from non-religious scholars. Paul, the actual scholars who have responded (those on the ASOR blog, for example) have had plenty of chance to look at the evidence. The responses have been substantive analyses of the evidence, showing that the authors’ interpretation of the data (despite the very impressive process by which they collected the data) is flawed. That’s the nature of scholarship, and when especially grand claims are made, everyone looks just a little harder at the evidence. Most of these scholars would love to have a legitimate find of this magnitude, but when claims like this are made (especially when they’re made without going through the standard channels of peer review) and then the data doesn’t hold to scrutiny, questions are asked about the motivation of the authors/excavators. “Substantive” is a relative term, is it not? Some of the ideas floated didn’t even last a day before being shot down by their proponents. You think having vehement opposed opinions within hours of hearing the news is taking a reasoned approach? Scholars take years examing and researching finds, and even then often waffle about, so when they have such strong opinions in such a short time it says something is wrong. Not to mention that so much of the ASOR blog is laced with bitterness and acrimony. Oh, Simcha isn’t a real scholar, he has no right to publish on archeology. They are in it for the — filthy — money. What pigs! Even you, you ask a perfectly reasonable question, but your tone implies that you have uncovered a fatal flaw in Tabor’s argument, even though you don’t really know the answer. I’m not a scholar, but I’ve read enough about this stuff to know that there are no finds or texts that don’t have loose ends and nothing is ever really settled because we are talking about speculation about things of which we have weak evidence. After decades of intense study, nobody knows what Qumran was, but they know within hours that Tabor and SImcha are wrong about this. It didn’t take very long to see that the epigraphic reconstruction was wrong, nor did it take long to look at the supposed “big fish” and see that it looks a whole lot more like a nefesh than it does a fish spitting out a man. Its completely vertical orientation itself makes such an identification highly improbable, for one. These are the same sorts of reactions that typically happen in the peer review process; the only difference is that because this was taken public before peer review, you’re getting to see it play out in public at a higher speed of communication than is usual. A) That is your opinion. April DeConick now says it looks like a fish — why is your opinion more valid than hers? Is she part of the conspiracy to make a quick buck? B) In peer review people hysterically accuse other scholars of bad faith? Jump to conclusions within minutes of reading paper? No, no, no. C) The nephesh theory has just as many, if not more, questions. You guys are rooting about hoping something will stick. People aren’t stupid. It is obvious that this sort of reaction is not normal. I’ve read BAR for decades, the professional jealousy and sniping at the heart of all these questions is sickening. If the early Christians did not understand the resurrection as physical, then how do you understand their application of Ps 16:10 (LXX 15) to Jesus’ resurrection in Acts 2:27, especially where it says “For you will not . . . let your Holy One experience corruption”? You amaze me here Jason. You say, just as one example, that it did not take “scholars” long to to see that the epigraphic reading was wrong? Where did you get that idea. Have you actually read my paper. I don’t offer one reading, but half a dozen, with all the variables. Which part do you think has been demonstrated to be wrong. The ONLY comment I have seen is Rollston’s assertion, incorrect BTW, that the iota of line 2.1 is a Tau–thus he wants to read osta (sic) for ostia–pl. of bones. Chris has not told any of us his transcription of the inscription or its translation. So how could you possible know it did not take long for “scholars” to declare what we present as wrong. We consulted with a half dozen epigraphers and what we present is extremely balanced. I find it hard to believe you would put forth this view. And now the “fish” is wrong to though we had a switch from a tower (6-0) to a perfume bottle in 24 hours…and yet, you claim the real “scholars” had plenty of the to consider things. We spent two years on this consulted with dozens of experts, a who’s who in the field, and then we presented our position. If someone wants to disagree fine, that is the nature of this discourse but to say there was no peer review when we far more experts than the average panel of “two or three” in peer review articles is simply false. I had read your paper within an hour of its publication. (I was frustrated a bit by the fact that at least some of the photos weren’t raw but were “penciled in,” FWIW.) I do appreciate the fact that you met with other scholars prior to publication, but many of those folks disagreed pretty strongly with your conclusions, and you know as well as I do that consulting with experts isn’t exactly the same as the peer review process in terms of forced revisions (that’s not to say that the peer review process isn’t flawed itself, however). Jason you are simply wrong about Paul. He plainly says in 2 Cor 5 that one strips off the old body like old clothing, is naked (Plato’s soul idea), then puts on new clothing. He does not say the old clothing becomes the new. Same in 1 Cor. 15. He never says the dust becomes spiritual…read it in Greek carefully. Jack’s point about Acts 2 is irrelevant. You can’t quote a text from the turn of the century and project it back 50 years and say Peter and all the boys were going around saying such things. Again, at the risk of being a broken record, I cover this thoroughly in our book. The notion of a physical corpse resuscitation is of course in Luke and John, and possible Matt, but it is late. What was the difference with Jesus. Well likely the hallucinations that people reported and the spiritual experiences they had of Jesus’ presence after he died. If you, Jack, and others think his body was transformed and went to heaven then why would you be trying to carry on a historical discussion. Dead people don’t rise. People believe they do but they don’t. They stay dead. No historian considers otherwise in dealing with ANY figure, so I am not sure what your point is here. Rotting corpses are nothing, even the “dead in the sea” come forth–so you really imagine the author of Revelation though physical bodies had to be somehow reconstituted where they could be “transformed” as you put it. Jason, you truly think the image looks more like a nephesh than a fish? What image do you have in mind. Have you been reading lately how all the nephesh folks have now converted to the perfume flask hypothesis–at least the ones who have spoken. Not one person on the ASOR blog since last Tuesday has supported the nephesh idea but you seem to still be there. And I thought you were wanting to tout the latest views of the “experts” since you don’t think Rami Arav, Charlesworth, and I are worth listening to apparently. Are any of these experts, other than Jensen, who originally said clearly it was a fish and even a Jonah image (see latest on her blog post) art historians other than Fine? And he has not chosen to enter back into the dialogue since his original post on day one. Yes, I do think it looks more like a nefesh than a fish, though it could be something other than either. It was just my first impression that it looked more like a nefesh or some type of amphora or jar than anything else that came right to mind, and a nefesh seemed to make the most sense, especially with the door next to it on the front of the ossuary and window on the side of the ossuary. It seems to be something of a Rorschach test at any rate, with several different options on what it could be. Were it horizontally aligned or even angled somewhat, I would be more inclined to see it as a fish, but in its vertical arrangement I simply don’t see it as a fish. Edit: Having seen the picture I just added to the post, I think my first inclination was wrong, and I’m now squarely in the perfume-bottle camp. I think we’re looking at a “house,” with a front door, a decorative bottle, and a window. Jason I really enjoyed visiting your blog and I wish you well in your work. Are you doing your dissertation on the Rom 9-11 ideas? I also love your sport expertise. You are a very interesting fellow…I need to move on but since your post was picked up by others I was curious to come and see what you had posted yourself. Thanks for your responses, James. I very much appreciate your interaction and your civility in all of this. I appreciate your concern that Acts is late. I agree with your late dating of the book — I think it’s second century. However, there is an indication in Paul that Ps. 16:10 was interpreted as a reference to Jesus’ resurrection in the early going: Paul’s reference in 1 Cor 15:4 to the belief ” that [Christ] was raised on the third day in *accordance with the scriptures*” cannot, in my opinion, be satisfactorily be explained in terms of a verse from Hosea (as most scholars prefer). The verse from Hosea simply cannot be twisted in that way. The best candidate for an OT passage that suggests that Christ would be “raised on the third day” is Ps. 16:10. Of course, to get that sense from it, you have to read it in the light of the widespread belief that the human spirit hovered over the dead body for a three-day period, and that the body *didn’t decay* for that period. (This belief lies behind the angels’ application of life-giving ointments to Abraham’s body in the *Testament of Abraham*.) The promise that the holy one would “not see decay” would then be understood, in this light, as a promise that he would be raised *before the three-day period was over*. IIRC, this interpretation was put forward by Douglas Hill in the pages of the *Expository Times* in the late 1960s. Although I know of no other takers, I think Hill’s suggestion presents a far better candidate for Paul’s unstated prooftext. Okay Jason…got to go but can’t resist…I still have not seen anyone offer any alternative interpretation of the inscription so for you to say the experts dismissed it right away is just not the case. Rollston has only commented on one letter, which I think he has wrong, but until he puts out his transcription and translation we will have to wait and see. As for early Xtn views of resurrection I think your idea of the physical body “transforming” into the spiritual, and thus the physical disappearing does not hold up. In point of fact the early Christian and Jewish discussions of resurrection debate this fully. It was only later that the corpse recusitation/transformation theory developed. But again, on Paul see 2 Cor 5. It is critical as it interprets 1 Cor 15. Old clothes are taken off, the tent is left behind, one is naked and unhoused, then reclothed and given a permanent house. You don’t turn the old clothes/tent, into the new, you leave it behind. The verb metamorphoo is the key…but enough for a blog comment, would you not agree! It’s not accurate to say that scholars who rallied around the “nefesh” idea were just engaged in “substantive analyses of the evidence”. It was absurd on its face and the only thing it had going for it at all was that those scholars couldn’t allow it to be a fish and had to find something, anything else. Likewise, when Rollston a couple days ago conclusively said iota’s never have transepts nor bases in 2nd Temple Judaism, and everyone rallied to him – “the epigrapher has spoken! !” Only for him to get schooled by Bauckham, a non-epigrapher who happens to be a careful scholar, a few days later, who cited his cases. The scholarly reaction has been utterly embarrassing. I don’t think much of the fish argument. But the people who’ve responded are clearly driven by something other than a desire to find the truth. I don’t agree. The initial responses may not have been correct, but that doesn’t make them less than substantive. They suggested other possibilities, potential problems, etc., which is the definition of substantive analysis. I don’t think it was “this can’t be a fish, what is it,” but “this doesn’t look like a fish and isn’t oriented like a fish, so what might it be?” This whole discussion has been a good example of substantive criticism, as better ideas and interpretations have come forward with time. But none that I have seen have confirmed the Tabor/Jacobovici interpretation of the data; if anything, the more people have looked, the less likely it appears. There’s no question that some of the responses were done in haste, but that’s because of the way the book was published and pushed to the public sphere right away more than anything. But the vast majority of those responses had indeed looked at the data and responded to the data. By “not oriented like a fish,” I mean vertically oriented and resting on the ground. I don’t see a stick figure at all. Even in your painted up reconstruction, you have to ignore other “sticks” that seem to me to be a part of the design at that part of the carving. I see a bulb on the bottom and decorative etchings on the inside of the shape. I most certainly don’t see a classic Ὠάννης pose, as I don’t see where two arms would be on one side of the figure with one above and the other below. I don’t see a head wrapped in seaweed. I don’t see the bars of Sheol on the end of the ossuary, I see a window as a part of an arch-roofed building representation. It actually looks like the ossuary shape itself, but with a window. Like I said before, it’s something of a Rorschach test, and it appears your team had Jonah on the brain to see a stick figure being spit out by a fish. If we can find other examples of a vertically-oriented, nose-down fish with a man in its mouth from this time period, I might be persuaded that this was just a very crude drawing of such a thing, but as things stand now, I just don’t see it. Regardless, the decorations on this ossuary are unprecedented, which makes this an important investigation either way. Hopefully we can find more of this sort of thing so we can have more certainty of what we’re actually looking at. And for what it’s worth, I was excited when I read the description in your article (which is well-written by the way; you deserve a lot of credit for having very readable, smooth prose), but once I got to the actual pictures I just didn’t see what you were describing. I was disappointed by that fact, but I still don’t see it. I could be persuaded that the inscription indeed includes the Name, but I would still have trouble with how it is construed, as the ΥΠΣΩ seems best taken as a first-person present rather than an abbreviation. I came across this blog due to curiosity in the subject material. I have no idea who you (Jason Staples) are, but I am not impressed by your line of argument, least of all your approach. I find myself agreeing with “Paul”‘s assessment.